As meditation naturally decreases your stress levels and leads to a healthier outlook on life it follows that it also helps to halt the aging process indirectly. Whilst this has been known for presumably as long as meditation has existed it has recently been discovered that meditation boosts natural levels of melatonin a hormone that increases immunity to illness, improves quality of sleep and may even reduce the risk of developing cancer. Whether due to an increased release in melatonin or simply due to its fostering a better outlook on life the anti-aging affects of meditation can be clearly felt and seen as well as being medically proven. Interestingly, the gland responsible for producing melatonin – the pineal gland – responds to the ‘Crown Chakra’ (or ‘sahasrara’, see related article) that is focused upon during meditation across many different spiritual practices and for this reason the scientific explanation of meditations obvious benefits is not at odds with spiritual belief. 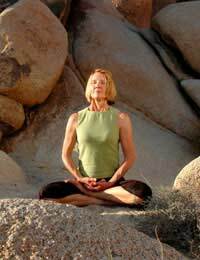 There is no specific one technique to halt aging during meditation, though it must be noted that to specifically meditate with a view to halting aging would indicate a desire and may be at odds with the practice of good meditation. Whilst meditation had been proven to halt the aging process, it is not wise to try to start vigorously meditating with the specific intention of turning back time or prolonging life. Meditation is a process that favours equanimity and a humble attitude, therefore it follows that the best benefits of meditation will be achieved through its steady practice, together with the adoption of ‘mindfulness’ in everyday life. Doing this will undoubtedly reduce stress and improve health, leading to a longer life, if the practice is prolonged over time. In fact, you will age, and at some point you will – in all probability - grow old and die. In our culture this is a fact that people find difficult to digest, even though the alternative to growing old is to die young, something which is surely less desirable! There seems in the Western world to be a respect for youth over age, despite the fact that age fosters the wisdom with which one can truly appreciate life. This attitude largely derives from a fear of losing control, of the unknown, and a basic inability to cope with the reality that humanity is still in thrall to nature and mortality. Spiritual meditation fosters an acceptance of change and of one’s eventual passing away. All life is change and flux and any attachment to the moment will ultimately hamper your enjoyment of it. In order to meditate effectively this is a fact that must be accepted, and for this reason meditating to slow the aging process must be conducted with no real striving to do so! For this reason the twin benefit of meditation with regard to aging is firstly that it will stop you being over concerned with aging, and secondly it will actually slow the aging process itself!